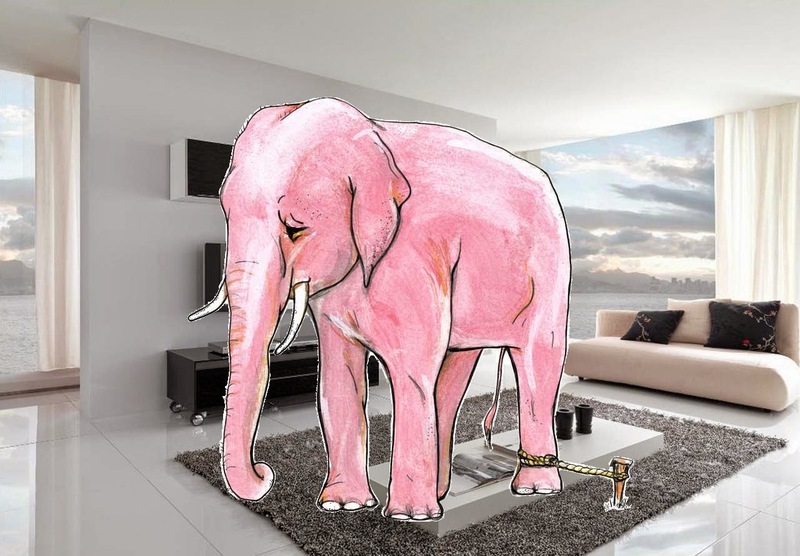 Here's a little story of a Pink Elephant in the Room. We've heard of a White Elephant... so here's a little on the Pink Elephant. A very large issue that everyone is acutely aware of, but nobody wants to talk about. Perhaps a sore spot, perhaps politically incorrect, or perhaps a political hot potato, it's something that no one wants to touch with a ten foot pole. Sometimes a 'Pink Elephant in the Room'. The degeneration of parental responsibility in this country is the elephant in the room, but no one in Washington wants to address it. "Elephant in the room" or "Elephant in the living room" is an English metaphorical idiom for an obvious truth that is either being ignored or going UN-addressed. The idiomatic expression also applies to an obvious problem or risk no one wants to discuss. It is based on the idea that an elephant in a room would be impossible to overlook; thus, people in the room who pretend the elephant is not there have chosen to avoid dealing with the looming big issue. "Financing schools has become a problem about equal to having an elephant in the living room. It's so big you just can't ignore it."